A Texas mother has been arrested after taking her son to hospital 323 times in what the child's father says is a case of Munchausen by proxy. Kaylene Bowen's son, who is now eight years old, underwent 13 unnecessary major surgeries, say police. The boy was removed from the 34-year-old mother's custody after Dallas hospital staff alerted authorities. Munchausen by proxy is a syndrome in which a person repeatedly exaggerates medical symptoms to get attention. 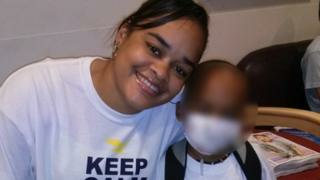 Ms Bowen, who denies the charges, claimed her son had a rare genetic disorder and cancer and needed a lung transplant. In his brief life, the boy - whom the BBC is not naming - has been placed on oxygen, given a wheelchair and a feeding tube, report local media. He has suffered three life-threatening blood infections amid all the invasive medical treatment, according to a court affidavit cited by the Fort Worth Star-Telegram. But medical staff have ultimately concluded there is nothing wrong with the child. The child's father, Ryan Crawford, told the Star-Telegram he had long suspected the mother. "She was always saying [he] was sick," he told the newspaper. "Every single week. Every single month." Mr Crawford, who was in an on-off relationship with Ms Bowen before she became pregnant, told the newspaper how he mounted years of court battles for parental custody, while paying $600 (£450) a month in child maintenance. According to him, Ms Bowen would tearfully tell judges: "The father doesn't need to be around because he doesn't know to take care of him." The mother is in Dallas County Jail charged with inflicting injury to a child. How did a mother convince doctors to operate on her children unnecessarily?